Cookies & Beer: Love Bites: (Belated) February Cookie of the Month! Love Bites: (Belated) February Cookie of the Month! Well hello! I am sooo failing at keeping up with the blog lately - but the reality is, life happens and that always comes first. And I have BIG news to share just as soon as I find the time to do it properly. I have "written" endless posts in my head that I'll hopefully empty into my keyboard for you one day soon! In the meantime, I wanted to share this tasty recipe I tried out with Max for Valentine's Day. 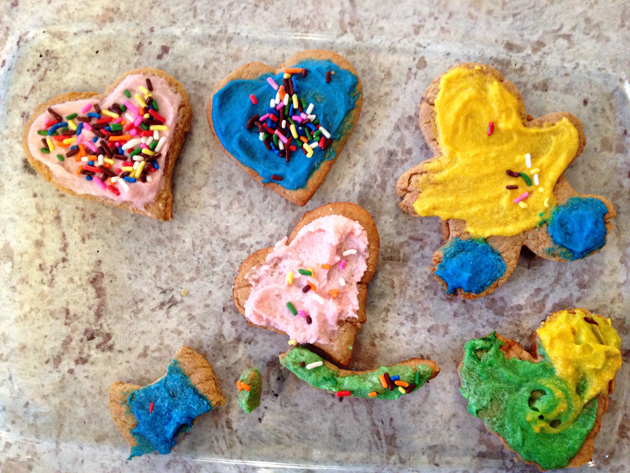 Ever since Christmas, I have been dying to make classic cookie cutter cookies with my little guy. By some miracle, I finally found the time in February. I couldn't shed my mom guilt about making cookies loaded with sugar and white flour (not to mention how bad sugar is for me during pregnancy), so I searched until I found a recipe that sounded close to the classic sugar cookie, but was a tad bit healthier. 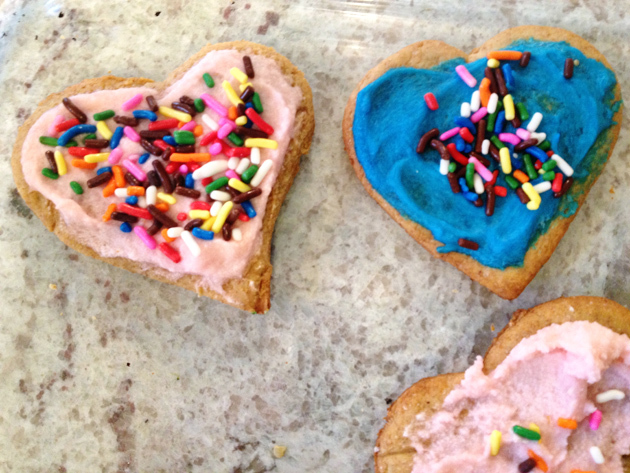 Enter the Snack Girl blog, with a perfectly adapted, healthful sugar cookie (that's an oxymoron if I ever heard one!). View the recipe here. Please pardon the wobbly camera phone photos! Basically she gets away with less sugar by using spices (nutmeg and/or cinnamon) and brown sugar (which has a richer flavor than white sugar), and less butter by browning the butter first. Browning the butter is a pretty genius move. It only takes a minute or two, and really brings out that rich buttery flavor that makes sugar cookies so addictive. I followed the recipe *almost* exactly; I didn't have white whole wheat flour, so I used half white and half whole wheat. And I opted for cinnamon instead of nutmeg, since I'm a cinnamon-aholic. My cookies had a light brown color due to the whole wheat flour, but that didn't bother anybody! Next time I'll add an extra tablespoon of butter, just to make the dough a bit softer and less crumbly to work with. 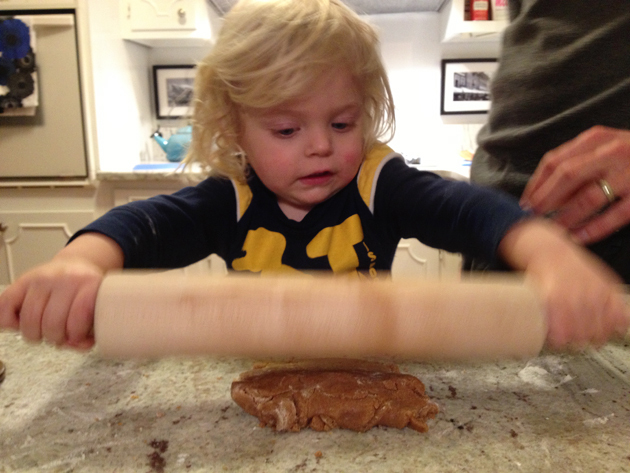 Now, you could follow the original recipe and just dust the cookies with powdered sugar before baking (obviously this is the healthier choice), but I wanted to let Max play with frosting. I found an awesomely simple recipe here, via allrecipes.com. I used Spectrum Organic All Vegetable Shortening (non-hydrogenated and trans-fat free, score! ), and vanilla almond milk in place of the regular milk, and the results were sugary and divine. We tried to use it sparingly, so as not to undo all of my efforts at making a lower-sugar cookie! 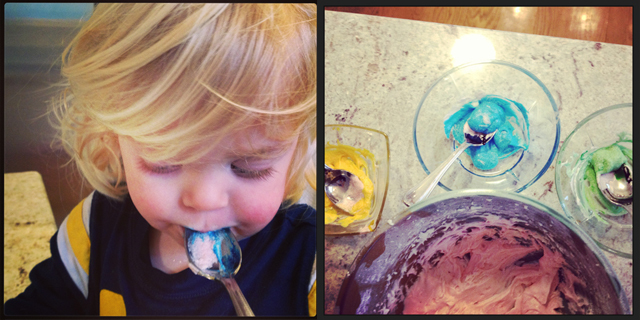 Max had a blast pouring food coloring into the icing and stirring it up. My little helper assited with every step of the process, from mixing the dough, to rolling it (that part was a big hit! ), to cutting shapes and then decorating them. I had sooo much fun, I can only hope he enjoyed it as much as I did! Ben even got in on the decorating action. These will not win any awards for prettiest cookies, but they are some of my favorites I've made in a while, because it was such a fun, hands-on project for my little man. Check out Snack Girl for the recipe!